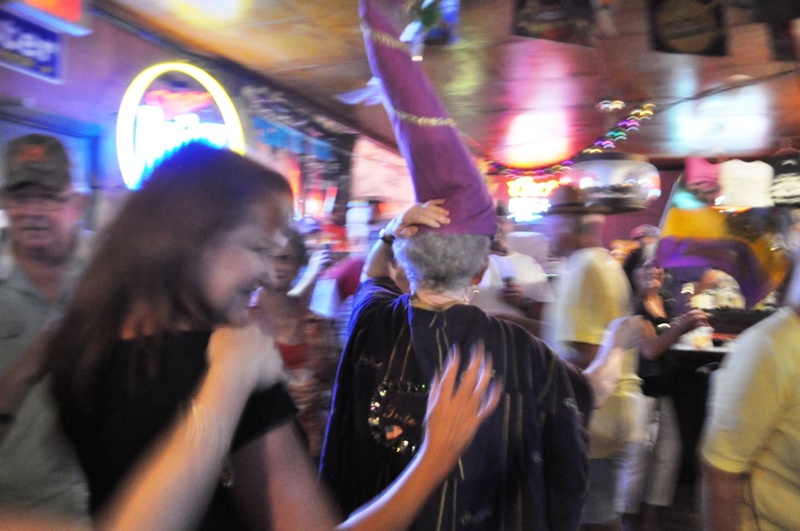 Tante Sue, Matriarch of Fred’s Lounge, Dances with a Patron, Mamou, La. Immediately stepping into the bar just shy of 9:30 on a Saturday morning a bath of smoke and Cajun music washed over me. A dozen couples danced around the five-piece band (the triangle player was apparently out with an illness) and nearly 100 patrons looked on either from the bar, a cluster of tables or the cushioned bench along the wall. 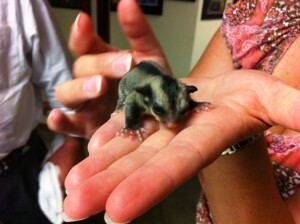 This was a slice of Canjun life. Many were locals while others were tourists easy to spot because they were armed with cameras and smartphones. If they weren’t sipping Bloody Mary’s from plastic cups they were nursing cans of beer. Spirits were lively and everyone waited in anticipation for the establishment’s matriarch, Tante Sue. Welcome to Fred’s Lounge in Mamou, La., where every Saturday morning the scene’s the same and no one would have it any other way. 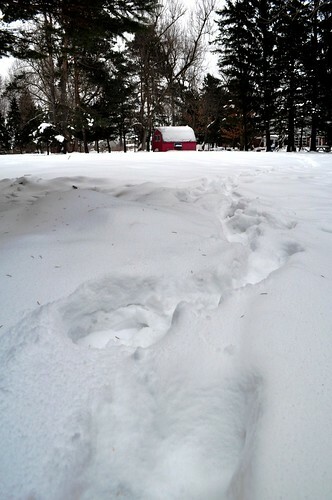 This is not a dance hall. If you get hurt dancing, we are not responsible. No substitute musicians!! Please do not ask!!! 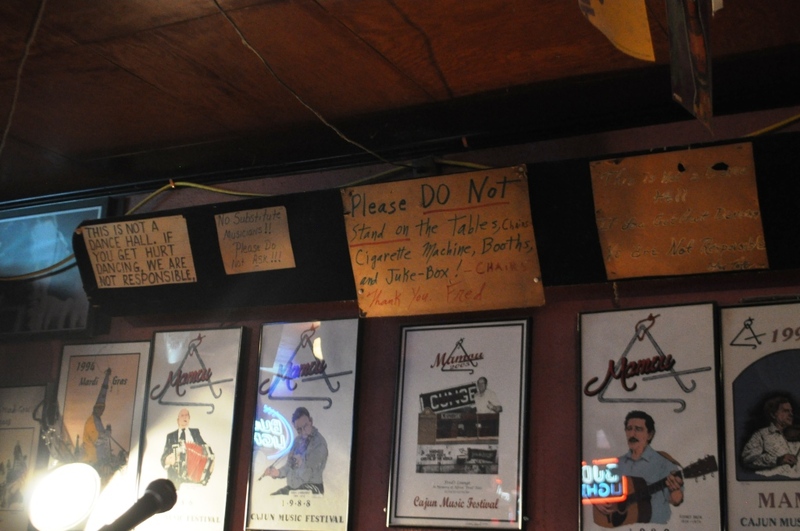 Please DO NOT stand on the tables, chairs, cigarette machine, booths and juke-box! – Chairs. Thank you Fred. I supposed these signs are left up there to let visitors know the type of guy Fred was. For sale were T-shirts with the “Please DO NOT Stand” statement. Fun! Fred passed away about 20 years ago but Tante Sue, his ex-wife, still shows up wearing a holster carrying DeKuyper Hot Damn Cinnamon Schnapps and takes a shot before posing with bar patrons for photos. She’s so warm, friendly and kind, she’ll give you a hug, too. 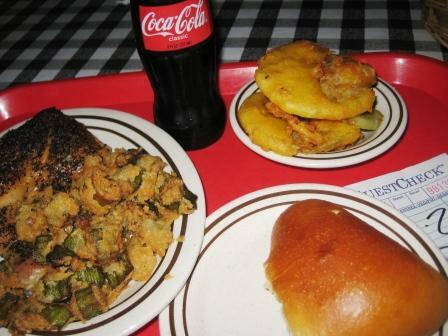 That morning the vivacious octogenarian arrived around 10 a.m. and carried in a white cardboard box of hot boudin to share with patrons. Later in the morning she put on her purple velvet cape – made from Crown Royal bags – Mardi Gras hat (it probably has an official name but I have no idea what) and flag then gives a singing performance followed by a parade through and around the lounge. You know, when you go to a wedding and the bride leads a train of people who hop on board as it weaves through the reception hall. If you go, don’t by shy and jump right in! Don’t worry if you’re not sure what to wear to Fred’s because it seems just about anything goes. I wore my standby denim skirt, red t-shirt, open-toed heals and pearls. Other women were dressed in everything from Sunday dresses to shorts and t-shirts to cardigan sweaters, pearls and pedal-pusher pants. Men were dressed in garments from polo shirts and khakis to fishing shirts and shorts to plaid button downs and blue jeans. See, anything goes. Oh, the place also seems popular with the motorcycle crowd so if you’re inclined to wear your leather and bandana, knock yourself out because you’ll fit right in. 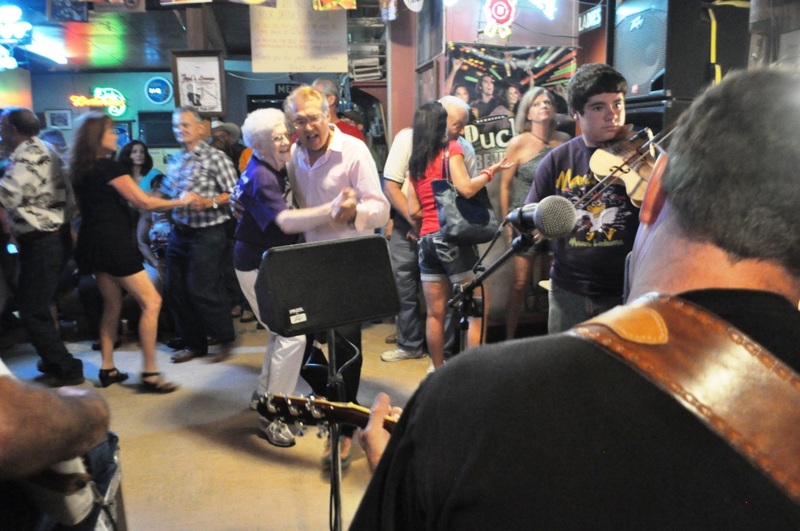 The town of Mamou, population around 3,200, is the Cajun Music Capital of the World and every Saturday morning since 1962, this musical heritage is celebrated with a live radio broadcast called Fred’s Lounge Radio Show on station KVPI (1050AM) . Catch the show between 9:05 and 11 a.m.
Fred’s Lounge is loud, crowded and a deliciously bizarre mix of local flavor and tourist attraction. Tasting this slice of Cajun life is an experience I’ll always cherish. Sign the guest book – prizes are awarded for those who traveled the most from within Louisiana, the U.S. and world. Don’t be afraid if an unknown man approaches you to dance. Enjoy the moment and dance! Bring your cash, Bloody Marys are $8 and drink responsibly! 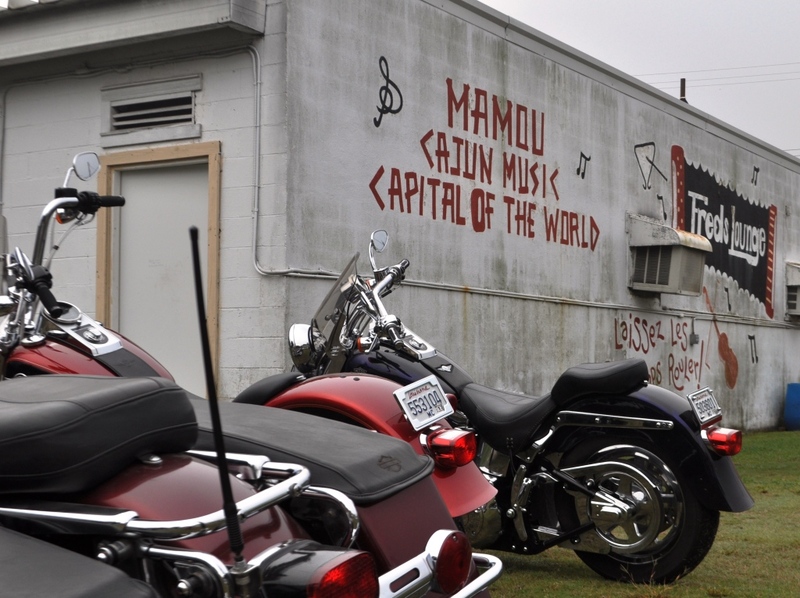 Mamou is located about an hour’s drive north of Lafayette. Remember, Fred’s Lounge is only open on Saturday mornings however has extended days of operation during Mardi Gras. Is Fred”s Bar in Mamou,smoke-free nowadays? thanks. Thanks for dropping by! It wasn’t smoke-free when I was there in Sept.